Image from "March: Three" by John Lewis, Andrew Aydin and Nate Powell. 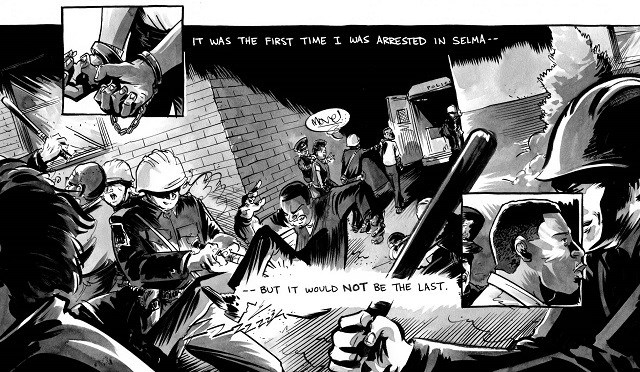 A comic book about Martin Luther King, Jr., and the Montgomery bus boycotts helped inspire a generation to take up the fight for civil rights. This included a teenager in Alabama named John Lewis. Congressman Lewis became a student leader in the movement and was at the forefront of some of the most pivotal moments in civil rights history. He has recently completed a trilogy of graphic novels to tell his own story in comic form. The third installment was just nominated for a National Book Award. Congressman Lewis and his co-authors on the trilogy “March,” and their hopes that it will inspire a new generation of social justice activists. Rep. John Lewis Democratic Congressman representing Georgia's 5th District and author of "Walking with the Wind: A Memoir of a Movement"
Excerpted from March: Book Three by John Lewis, Andrew Aydin and Nate Powell. Copyright © 2016 by John Lewis and Andrew Aydin. All rights reserved. No part of this excerpt may be reproduced or reprinted without permission in writing from the publisher. MS. DIANE REHMThanks for joining us. I'm Diane Rehm. At age 25, Congressman John Lewis was already a veteran of the civil rights movement. He had spoken at the March on Washington, helped to integrate lunch counters, been in and out of jail. Many victories have been won, but the next battle was clear, insuring every African American in the United States had access to the ballot box. He tells the story of this struggle in the last installment of his graphic memoir trilogy titled. "March." Here in the studio, Congressman John Lewis and his co-author Andrew Aydin. And from WFIU in Bloomington, Indiana, the man who illustrated "March" Nate Powell. MS. DIANE REHMAnd, of course, you are invited to be part of the program. Give us a call at 800-433-8850. Send an email to drshow@wamu.org. Follow us on Facebook or send us a tweet. And how wonderful to see both of you and have you all on together today. REP. JOHN LEWISWell, thank you so much for having us on. I'm so happy and grateful to be on your show with Andrew Aydin and Nate Powell. These two young men have become like brothers or maybe even sons. They are so smart and so gifted, Andrew as a writer and Nate Powell as an illustrator. He has the capacity to make the words dance and sing with his graphics. REHMAbsolutely. I have been enjoying reading and gazing at these illustrations, reading the words. I wonder, Congressman Lewis, "March: Book Three" was just released in August and last week, it became a finalist for the National Book Award. I wonder if you're all surprised by this, Congressman Lewis. LEWISI was deeply surprised and moved and touched. I don't think Andrew or Nate were surprised, but this is my first time down this road and I was truly surprised. REHMAll right, Andrew, what about that? AYDINThey call us and they're trying to go over logistics and get information from us and I was just sniffling through the whole phone call. AYDINIt just meant so much to us because Congressman Lewis started this journey with us eight years ago and so now, after all that time and all that work, to be at this point, it just meant so much. It was almost too much. REHMExactly. And Nate, how about you? MR. NATE POWELLWell, it's been just a wild ride and I think we were all blown away, and it really just shows that I think people are hungry for some answers, something to absorb, move forward with so we're really glad to be part of that process. REHMYou know, it's so ironic. I just finished watching the HBO program on LBJ, which came out a while back and that video focuses on the push to give African Americans access to the ballot box, which is exactly where you are in this book. Talk about some of the obstacles you faced. LEWISWell, during the '60s, it was very hard and almost impossible for many African Americans to participate in a democratic process, especially in the South, the 11 states of the old confederacy, from Virginia to Texas. People stood in an unmovable line trying to make it up steps to get into a courthouse. In a place like Selma, Alabama, you could only attempt to register to vote on the first and third Mondays of each month. You had to pass a so-called literacy test. People were asked, from time to time, to count the number of bubbles in a bar or soap, the number of jellybeans in a jar. LEWISThere were African American lawyers, doctors, teachers, high school principals, college professors over and over again. And sometimes people harassed them when you're trying to organize a voter registration campaign, the churches would be burned or bombed. People would be beaten, arrested or jailed. Even before 1965, in 1964, three young men that I knew, Andrew Goodman, Michael Schwerner, and James Chaney, two young white men and one young African American man, went out to investigate the burning of an African American church near Philadelphia, Mississippi. LEWISThey were stopped by the sheriff, arrested, taken to jail, later taken out of the jail, turned over to the Klan where they were beaten, shot and killed. We didn't give up. We kept the faith and we kept pushing. REHMAnd the manner in which you, Nate Powell, present that visually is really dramatic. Talk about your thinking as to how to present this. POWELLWell, for so many of these scenes and so many of these accounts, I tried to remain as close as I could to the recognition that we were talking about people in their 20s and 30s and we're talking about people who, in many respects, had lives very similar to those of mine and the people I know. And so in so much as possible, I tried to stay as close to their perspective, what they were seeing, hearing, smelling, touching, feeling and really allowing the experience to tell itself without leading it too much. POWELLAnd in a lot of cases, that lead for a very harrowing account and I feel that, you know, connecting a reader or a viewer to that very intimate subjective experience of being in the middle of some of these situations can be the most powerful of all. REHMAnd the horror of those who found those three bodies really depicted very clearly. How did you come to that? POWELLA lot of it had to do with after doing enough research and getting enough research in from Andrew and from the rest of the team in terms of physically how the discovery occurred -- my family is all from Mississippi, starting with my parents' generation and so a lot of it has to do with trusting my knowledge of the topography and of the climate and really allowing myself to dig into the Mississippi earth to let the machinery do its job in so much as I may be allowed to. It had to do with walking around in the shoes of the people involved and really kind of embracing that from a storytelling perspective. REHMAndrew, you might just talk, take us back a little bit for those who may not have heard this story, how did this whole project begin? AYDINWell, it all started in 2008. It was the summer of hope and change. Barack Obama was sweeping through the Democratic primaries and I was serving on the congressman's reelection campaign down in Atlanta. And it was sort of coming to the end of the campaign when folks were talking about what they were going to do afterwards. Some folks said they were gonna go to the beach. Some folks said they were gonna go see their parents. AYDINAnd I said I was going to a comic book convention. And as you can imagine, the folks on the staff sort of laughed at me, except I heard a deep voice say, don't laugh. There was a comic book during the movement and it was very influential. And it was John Lewis standing up for me, as he stood up for so many of us, and the comic book he was talking about was called "Martin Luther King and the Montgomery Story." And I went home that night and I read it online. I read it on the Internet. AYDINAnd it was amazing because here it was. It was just 16 pages, including the cover, but it walked you through the Montgomery bus boycotts and the introduction to Dr. King and introduction to Gandhi and Rosa Parks and just nonviolence and it was beautiful. And I just became captivated by the idea of a comic book playing a significant role in the movement and started thinking, well, if this is about the Montgomery bus boycott, John Lewis was a part of every seminal moment after that just about and here I've grown up in Atlanta, he's been my congressmen since I was three years old. AYDINAnd yet, I'd never heard the story of the young people, the story of SNCC, these same stories that I'd watched and spent him spend that summer telling people and watching young people light up when they heard. And so I just started asking him, well, Congressman, why don't you write a comic book? He's so sweet. At first, he said, well, maybe, which is a really nice way in politics of saying no. But I just couldn't give up on this idea. I mean, it just seemed self-evident to me. AYDINAnd so I kept asking and I kept asking and finally, the congressman said, okay, I'll do it, but only if you write it with me. REHMAh, and you, Congressman, were finally convinced this was a good way to reach out to young people to teach them the history of what had happened. LEWISWell, I was very much convinced that this was the right thing to do. I recalled how much this little book changed my life and taught me the way of peace, the way of love, the philosophy and the discipline of nonviolence and I saw how this one little comic book that sold for ten cents had created a mass movement of hundreds and thousands of young people standing up, speaking up, speaking out and getting involved in the sit-ins, the freedom rides and the marches. LEWISSo I'm glad Andrew asked me and I'm glad I said yes. REHMCongressman John Lewis, he's Democratic congressman representing Georgia's fifth district, author of "Walking With The Wind: A Memoir of Movement," and very much author, along with Andrew Aydin and Nate Powell of "March," the third volume, book three has just been released. Short break, stay with us. REHMWelcome back. Congressman John Lewis is with me, along with Andrew Aydin and Nate Powell. Together, they have produced "March: Book Three," the story of the civil rights movement, the struggle to gain the vote for every American in this country. I'm going to read you a summary of comments that we've had on the website. Enough talk of the 1960s. Why don't you understand that we're tired of hearing about this. How do you react to that, Andrew? AYDINI think the problem is that we haven't learned enough from the 1960s or about the 1960s. The Southern Poverty Law Center coined a term a few years ago called the nine-word problem, where they looked at civil rights education in the United States and how it was being taught in schools across the country. And what they found was that the vast majority of high school students are graduating knowing only nine words about the civil rights movement -- Rosa Parks, Martin Luther King, and I have a dream. And that's it. AYDINAnd that's part of the reason our politics are in the predicament they are today, because you cannot understand the politics that are happening around us without understanding the 1960s, because so many of the harshest things that are happening right now have their roots in the backlash to the successes of the civil rights movement. REHMSo, Congressman Lewis, in 1963, the calls really, really began for one man, one vote. How did it begin? LEWISWell, in 1963, when I was much younger, had all of my hair and a few pounds lighter, it was my responsibility to speak at the march on Washington. And I remember reading a copy of The New York Times and saw a group of black women in southern Africa carrying signs saying one man, one vote. So in my march on Washington speech, I said something like, one man, one vote is the African cry. It is ours too. It must be ours. So the young people in the student non-violent coordinating committee started using it as a slogan. We put it on cards and letterhead -- one person, one vote, one man, one vote. And we went all across the South organizing and mobilizing. And we were determined to make it happen. REHMAnd where was President Lyndon Johnson in all this? LEWISWell, in 1963, when we started speaking of this, he was vice president. And later, after President Kennedy was assassinated, he became the president. And he shepherded and he got the Civil Rights Act of 1964 passed and signed in to law and it stated very little about voting rights. So we came back demanding that we get a voting rights act through the Congress. And President Johnson said, you know, I just signed the Civil Rights Act. We don't have the votes in the Congress to get a voting rights act passed. And he said, in effect, if you want it, make me do it. LEWISAnd we intensified our efforts. We went to places like Selma and other parts of the South. And on Bloody Sunday, March 7, 1965, a group of us, 600, made a decision to walk from Selma to Montgomery, to dramatize to the nation and to the world that people of color wanted to register to vote. So we were beaten. We were trampled by horses, tear gassed, left bloody. And some people died, that came to volunteer to help. And President Johnson responded by speaking to a joint session of the Congress. And he made one of the most moving speeches any American president made in modern time on the question of voting rights of civil rights. REHMAnd we have a clip of President Johnson speaking on March 17, 1965. Let's hear it. PRESIDENT LYNDON JOHNSONThere is no cause for self-satisfaction in the long denial of equal rights of millions of Americans. But there is cause for hope and for faith in our democracy in what is happening here tonight. For the cries of pain and the hymns and protests of oppressed people have summoned into convocation all the majesty of this great government, the government of the greatest nation on earth. Our mission is at once the oldest and the most basic of this country, to right wrong, to do justice, to serve man. REHMAnd gaining justice in that era, still, in today's world, does not guarantee that that vote is there for every single person. LEWISWell, I've said over and over, on so many different occasions, that the vote is precious. It's almost sacred. It is the most powerful non-violent instrument or tool we have in a democratic society. And all of us must be able to use it. Use it for good. Use it to change things, to bring our people together. And help create for Dr. King called the beloved community. REHMI wonder how relevant you see this book, Andrew, in today's world, considering the kinds of incidents of police shootings, of shootings in absolute innocence that have happened recently? AYDINI think when we started this, we felt we were telling history. But as we got to book three and through book two, it felt as if we were telling a story of America today. And "March" succeeds not just because of the story it tells, but because it's a graphic novel in particular. This generation, they're digital natives. They grew up on the Internet. So they grew up in sequential storytelling form, right, words and pictures. That's what a meme is. That's what most of our communication methods are, whether it's Facebook or Instagram or Twitter, these are words and pictures coming together to tell a story. AYDINAnd so if we want to reach this generation with this story, so that they understand and feel connected to another period -- to the 1960s, to this sense of revolution -- then we have to do it in their language. And so by doing it in a graphic novel, we make it as a conscience because we make it plain, we make it real. And that's, I believe, a big part of why you're seeing so many people reading "March." REHMAnd, Nate Powell, why you're seeing so many people connecting what's happening in "March" to what's happening today. POWELLWell, I think that as a creative team, increasingly, from "March: Book Two" to "March: Book Three," we found the contents not only echoing and paralleling a lot of what was happening in 2014, 2015, 2016, but the connections became so powerful in that third volume, that we had to kind of regularly discuss the fact that a lot of these accounts in 1964 or in '65 were for us, as a creative team, much more, in some ways, about 2016, about 2017, about 2019. POWELLAnd beyond that, we determined that we really didn't have to lay anything out extra. We let the story tell itself. We sort of trusted the contract with the reader or the viewer. And being able to be a part of that discussion publicly and privately with readers has been very meaningful in terms of eliminating and pushing that facet of the book. REHMAll right. I want to take a caller. Colin, in Silver Spring, Md., you're on the air. COLINHi, how are you doing? COLINI just wanted to mention -- I'm a product of Montgomery County Schools, I went to BCC, which for a long time was a top-50 high school -- and I can count on one hand the two times that we discussed either slavery or learned about the civil rights movement in public school. And in fourth grade, we essentially did a little role play about what slavery was and very, very basic, very broad, with no implication about how it related to race. The teacher was very careful to make sure that -- I'm a white man, and I was the slave and then a black guy was the slave owner and, oh, he put me on a ship and took me to America. COLINAnd then in high school, or in middle school, we watched a cartoon about a young man who ends up going back in time and meeting Martin Luther King. And that was very -- the cartoon was very stunning and very shocking, when -- because it actually does come to the conclusion where Martin Luther King is assassinated. But in high school we never once discussed it. We were required to take two American history courses in an NSL (sp?) and we never did much history regarding the black experience in America or the civil rights movement. And it was a -- such a level of sterility when we did discuss the civil rights movement, as if it was like the climax of where suddenly, okay, now everything's better. COLINEverything's -- this is where it ends. REHMAnd what you're demonstrating with this particular book is how it came about, what you all went through. But the story continues clearly. AYDINWell, I think that's part of where our decision came from to frame the story around the inauguration of President Barack Obama, Congressman Lewis speaking to the students that day. But, you know, "March" is changing this. We've already got school systems like the New York City Public Schools, Atlanta -- City of Atlanta Public Schools just announced last Friday, schools all across the country are using "March." And I think it's because so many teachers see that their students need to feel their own power, they need to understand what they're capable of. And it's hard not to feel as if there was a deliberate and systematic effort years ago to keep non-violence out of schools, because they were afraid of young people recognizing that power. AYDINBut I've been on Capitol Hill for 10 years. I've worked for John Lewis. I've worked for other members of Congress. And I can tell you, most elected officials, they're more afraid of young people than young people are of them. And if we can show them their power and what they're capable of doing and how another generation did it, I don't think there is a limit to what they're capable of doing to move America forward. REHMInteresting, Congressman Lewis, that in this young man's classrooms here in Montgomery County, one of the wealthiest, most educated counties in the country, almost nothing taught about that. LEWISWell, it's -- it is very sad that in this day and age so many of our young people, whether they be African-American, white, or Latino, Asian-American, Native American, did not receive in their education a learning what they should grow up learning and knowing something about -- the civil rights movement was about freeing and liberating us all, creating this sense that we're one people, that we're one family, that we all live in the same house, not just the American house but the world house. REHMAnd those kinds of sentiments, Nate Powell, are difficult to convey on the page in drawings. But somehow you've managed to do it. You were pulling, you said, from your own experience growing up in Mississippi. What was that like in your own day and age? POWELLWell, the older I get, the more compressed that passage of time becomes between my parent's generation and my own. So growing up in elementary school in Montgomery, Ala., my Mississippian, baby-boomer parents would give me a pretty basic working knowledge of the civil rights movement, just key moments, key figures. And as an aside, importantly though for this project, I kind of carried into adulthood that this is a default part of the American kids' experiences is growing up with this kind of knowledge of the movement embedded, as slight as it was. A lot of their tales, however, would sort of be peppered with this exception at the end, that it was a different time. POWELLAnd I've spent much of my work on "March" countering that with Congressman Lewis's mandate, you know, if you want to tell me that nothing has changed since then, come walk in my shoes and I will show you change. But at the same time, as a kid, you know, my parents were telling me stories of what was happening 15 years before the fact, 10 years before I was born. And that's nothing. REHMAnd you're listening to "The Diane Rehm Show." We have a tweet from Tenise, who said she was teaching "March," the book, when Ferguson happened. Students were able to connect the visuals, the graphic novel, the news cycles, so it became so much more powerful. LEWISAnd that is great to hear that these young people with a wonderful teacher, had the courage and the know-how to share to a student, through teaching, this is what happened in another time, in another period. REHMAnd another tweet. Voter ID laws have roots in pre-voting-rights act suppression of the black vote. This is why the history of the '60s is so important today. Do you see efforts at work to suppress the black vote? Or is this a legitimate concern about illegal voting? Congressman. LEWISI truly believe there is a deliberate, systematic effort to suppress not only the black vote, but the vote of young people, senior citizens, and people that some people feel or believe they're not going to be voting our way. It's taking place not just in the South but all across America. And we have to stop it. REHMAnd, of course, the Voting Rights Act, itself, has been tampered with. But at some points, the Supreme Court has stepped in and said, you cannot do this. LEWISBut we need to do more. The Congress needs to fix what the Supreme Court did much earlier. REHMAll right. And we're going to take a short break here from our conversation about "March: Book Three," written, illustrated by John Lewis, Andrew Aydin and Nate Powell. Your calls, your comments, after a short break. Stay with us. REHMAnd welcome back. We're talking, if you just joined us, about "March: Book Three," written by John Lewis, together with Andrew Aydin, illustrated by Nat Powell, an absolutely wonderful rendition of the last years of the civil rights movement, and even as I say that, I know I'm wrong. I know that the struggle for civil rights continues even today. Some people, however, do want to go back and look at the role of Democrats in this whole effort of civil rights. REHMAn email from Eddie, talk about the Democrats who passed Jim Crow laws and the Democrats who filibustered civil rights legislation, Congressman Lewis. LEWISWell we had, in the American South, for many years politicians that supported segregation and racial discrimination, schools, the laws, every -- public accommodation. But at the same time we had Democrats outside of the South, in the Midwest, the far West, the Northeast, who stood up, who spoke up and spoke out. And we created a climate, an environment, that changed America forever. LEWISDemocrats working with Republicans got the Civil Rights Act of 1957 passed, the Civil Rights Act of 1964 passed and the Voting Rights Act of 1965. And I say over and over again that -- when people say nothing has changed, the signs that I saw, they're gone. Growing up in rural Alabama, visiting Montgomery and Birmingham, little towns like Troy, going to school in Nashville, those signs are gone. They're not in Atlanta. They're not anyplace in the South. LEWISBut we have problems even today. But as a people we will continue to make progress. We cannot go back. We're going forward. REHMLet's go to Chris in Jacksonville, Florida. Hi, you're on the air. CHRISThank you, Diane, for taking my call. How are you today? The question I have is for Congressman Lewis. I was just wondering if, in light of what appears to be institutionalized racism, frankly, in a lot of police departments all over the United States, is it going to take another widespread, long-term, very concerted effort, again like another civil rights movement, you know, now to root that out, to take care of that? Or do you think there is any way to remove that and really get it, you know, taken care of so that, you know, there is just no more of that institutionalized racism there? LEWISI think it's important for all of us to be taught the ways of being a little more human. Individuals might just -- young people, well, all of us as citizens, police officers, as well as the citizenry, should study the way of peace, the way of love, study the philosophy of nonviolence and try to be kind to everyone and just be human. REHMAnd here's an email from Stuart, who says I'd like to hear Congressman Lewis respond to allegations of voter suppression during the primaries of 2016, how he feels about younger people feeling disenfranchised by the actions of Democratic National Committee chairwoman Wasserman Schultz to use undue influence to persuade committee members to not support Senator Sanders. LEWISWell, I always said to all of my colleagues and all of my friends, when you see something that is not right, not fair, not just, you have an obligation to speak up, to speak out and say something and do something. REHMSo how did you feel about Bernie Sanders in the race with Hillary Clinton? LEWISWell, Bernie Sanders had a right to run, but we must keep in mind that he was not a Democrat, that he entered the primary to run as a Democrat, and as far as I've been able to observe, they both got out there and fought hard for Democratic votes. REHMWhat about the Black Lives Matter movement? To what extent, Andrew, I know as you were writing this book you were thinking about what was going on today. How influential, how important can that be as we go forward? AYDINWe dedicated the entire series to the past and future children of the movement for that very reason. The Black Lives Matter movement is growing, it's developing, it's coming of age in some ways. I think what we hope to do is to show through these graphic novels how another youth-led movement was able to successfully pressure elected officials into changing the laws. AYDINI think we have a system that has neglected its most vulnerable citizens on several levels, whether it is their treatment by some police officers but also the mental health care system, housing, the financial system, education. There are so many issues where the most vulnerable citizens among us are being left out and left behind, and we have to have an activist generation to deal with it because otherwise the country itself will be weaker. REHMI wonder, Nate Powell, whether you're already creating images in your head about Black Lives Matter. That movement has, I think, brought all these issues to the fore in ways that might have gone by as individual incidents, but Black Lives Matter has focused every one of us on what's happening around the country. POWELLCertainly that's been unavoidable, particularly when anticipating potential readership or audience of our story. And we've been fortunate enough to be involved with a lot of discussions on campuses and certain communities that have resulted in a little more personal involvement with various local players within the modern-day movement. It's also important that by the end of the "March" trilogy, there really -- there is no neat end to the story arc. POWELLNot only is it -- is an account of true events, but we wanted to emphasize the fact that the struggle is ongoing. In Congressman Lewis' opinion, this was the end of the civil rights movement as he knew it, with the passage of the Voting Rights Act in 1965. But we also wanted to stress that the work and the struggle continued far after and continues to the present day. REHMCongressman Lewis, how important do you believe that the Black Lives Matter movement is to the growing understanding of what's happened to our country? LEWISI truly believe that Black Lives Matter movement and effort so important. You have this unbelievable, growing group of young people, and it's not just black people involved in it, black young people, but it's white young people, it's Hispanic young people, Asian-American young people, saying what affect one of us affect all of us. So it's the same way of the modern-day civil rights movement. LEWISIt was not a black movement. It was all people working together for the common good. REHMAnd of course what happened in Baltimore really got things moving, and do you believe that Black Lives movement can truly have an impact on police forces across the country? LEWISWell, I truly believe that this movement can have a major impact on police involvement and leadership and as a group make people a little more sensitive, a little more caring and a little more careful. REHMMaybe what you've got to do in addition to getting this book into elementary high schools and colleges is to get it to police departments, Andrew. AYDINI think that would be a great step. You know, the congressman has a saying when he talks about "March." He says it's for people. He says it's for young people and people not so young. And, you know, I listen to folks in Congress, folks on television, folks just in our community, and there just isn't an understanding of the nuance of the civil rights movement, of the tremendous commitment that had happened. AYDINYou had a question earlier that talked about the role of Democrats during the movement, and yeah, Strom Thurmond was a Democrat when he outed Bayard Rustin on the floor of the United States Senate. But you also had a Republican, Everett Dirksen, who helped in the Senate to pass the civil rights and voting rights legislation, something you don't see today. Where are those people working across the aisle? AYDINAnd so when they look at it from a myopic vision, of course they don't understand it, and that's why it's so important that we teach every single person. We're not just playing catch-up in our schools, we're playing catch-up in our society so that every person who is able to vote, who wants to participate in our democracy, understands how we got to where we are today. REHMAnd there are an awful lot of people, because of the nature of this particular election process, who don't want to vote at all, Congressman. What do you say to them? LEWISEverybody, each one of us, must participate in the democratic process. We have to go out and vote like we never voted before. I followed every election since the election of President Kennedy in 1960. I have never seen anything like this. We have to get it right. If we fail to get it right, history will not be kind to us. REHMWhat do you think's gone wrong? LEWISSomething happened. I don't think it's in the water you're drinking, I don't think it's in the air we're breathing, but something happened, and I truly believe that we need to come together as a nation and as a people. And maybe, I was thinking just earlier this morning or late last night, what created this, what created this climate, this environment. We want to live in a better place, in a better country. And we want to serve as an example for the rest of the world. REHMBut how did you answer your own question? What did create this environment? LEWISI don't know exactly how to answer my own question. Sometimes I want to say that, you know, some force over there, a group of people came together and made a decision. There's been so much meanness, so much hate. REHMThat must really be frustrating for you on the Hill, where virtually nothing has gotten done. LEWISWhen I first came to Congress, we worked together, we pulled together for the common good, and something happened in the process. We need to fix it. REHMI hope we can fix it. Here's an email from Sophie, who says the civil rights movement of the '60s sought to change laws in order to combat racial injustice. I feel as though the institutional racial problems today cannot be fixed with a change in laws, but rather a change in the educational enforcement and economic systems. Do you agree with that? LEWISWe need to work on all fronts and try everything. REHMAnd we need to have a good and honest election. And you're listening to the Diane Rehm Show. Let's go now to Jim in Charlotte, North Carolina. You're on the air. JIMThank you, Diane, it's a pleasure to listen to you folks discuss this. I'm a civics teacher in Charlotte, North Carolina, and when I heard the previous caller from Maryland call in and say that he hadn't been exposed to the civil rights movement, I was -- I was appalled because I'm a public schoolteacher, and I teach that religiously in my class. That's something that should never be forgotten because it affects all Americans, and for us to stow that away in the footlocker of history is an embarrassment. There's always something to be learned from this. REHMAnd Jim, the question is, have you used "March" in your classrooms? JIMI have not, and listening to this just made me realize that's another fantastic tool that I need to get my hands on. REHMYou bet. Thanks for calling in. Congratulations for your work as a teacher, which I have always considered one of the most important jobs in our country. So what's next for all of you? Are you talking about this ongoing around the country? What are you doing, Andrew? AYDINWell, we are going to go to the National Book Award ceremony the week after the election. I'm going to try and talk my mom into coming. And then I think the congressman is actually going to Nashville to accept a very prestigious literary award there, as well. And then Nate and I will be going to the National Council of Teachers for English, and then we'll also be going to the Miami Book Fair. AYDINAnd that's all in one week, but that's the week after the election. So if we can survive, if we can get out there, and I think all of us are going to try and get out into the field and do everything we can to in some ways stave off the apocalypse. REHMAnd how about you, Nate? POWELLAndrew is very correct. I think that all the work that went into making the "March" trilogy revealed itself to only be half of the process. So now that the trilogy is complete and ready to get into people's hands, it's almost like the real work begins of relentlessly discussing its application, pushing it as far as we can go. I think when the first book dropped, we had no idea what the potential scope or scale was, and since then we've been running to meet those challenges in real time. REHMReally an extraordinary outpouring of support. REHMAnd I wonder, Congressman Lewis, where you are going to be. I know you'll -- I'm sure you'll be at the National Book Awards, but you're also traveling the country on behalf of Hillary Clinton. LEWISI've been traveling, and I'm going to continue to travel all across America. It is so important that we elect her as the next president of the United States of America. REHMCongressman John Lewis of Georgia's Fifth District, he and Andrew Aydin and Nate Powell have produced "March: Book Three" and of course have produced the entire trilogy, books I assure you worth reading and enjoying. Thanks for listening, all, I'm Diane Rehm.